Additional Info: There is a large ramped veranda with a picnic bench. The caravan is situated just a few minutes walk from the main venue. All gas and electric is included but the Price does not include entertainment passes. They are purchased from reception on arrival. We take £50 non returnable deposit and £50 returnable bond asap to hold the booking with the balance payable 6 weeks before holiday dates. We are also happy to take instalments. The lounge has ample seating a gas fire and a TV with built in Freeview and DVD player and a selection of DVD's. There is a dining table with wrap around seating. The kitchen has a gas cooker, fridge, table top freezer, microwave, toaster and kettle and ample crockery etc for all your cooking needs. There is a shower room with shower, sink and toilet. 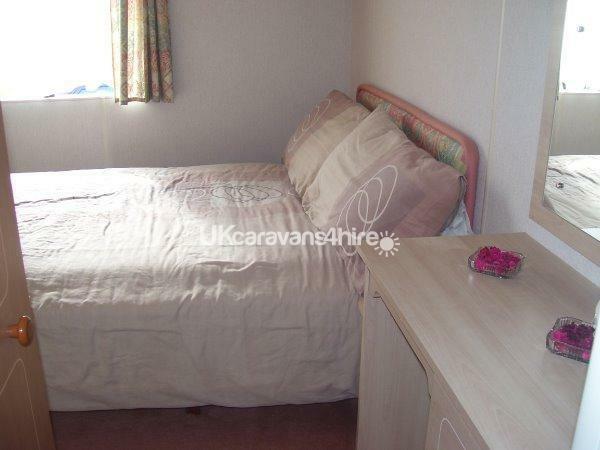 The caravan is a 6 berth with 3 bedrooms, a double, twin and a bunk room. Duvets and pillows are provided but you will need to bring your own bedding, towels, T towels etc. there is also a travel cot.